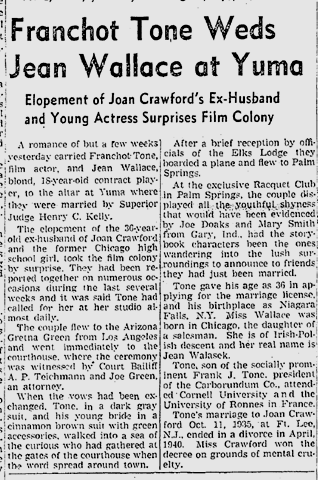 Oct. 19, 1941: Franchot Tone marries Jean Wallace in Yuma, Ariz. Wallace and Tone divorced in 1948 and in 1951 Tone was badly injured in a fight with Tom Neal at the home of Tone’s ex-fiancee, actress Barbara Payton. Tom Treanor, who was killed in France covering World War II for The Times, takes a look at the use of aerial photography, such as recording a fire drill at a defense factory to see whether employees follow instructions. Jimmie Fidler says: Slapstick comedy, pronounced hopelessly passe years ago by every Hollywood voice of authority, is again the industry’s richest gold mine. A couple of burlesque clowns named Abbott and Costello have scored sensational success, packing theaters and so many appreciative fans that the studio felt justified in boosting their paychecks more than 1000% during the year. Also on the jump: The top books of the week. How many 1941 bestsellers have you read – or even heard of? This entry was posted in 1941, Art & Artists, Books and Authors, Columnists, Comics, Film, Hollywood, Jimmie Fidler, Tom Treanor and tagged #film, #Franchot Tone, #hollywood, #Tom Neal, Barbara Payton. Bookmark the permalink.